Home Android Fix/remove unknown error during application install 919 in play store. 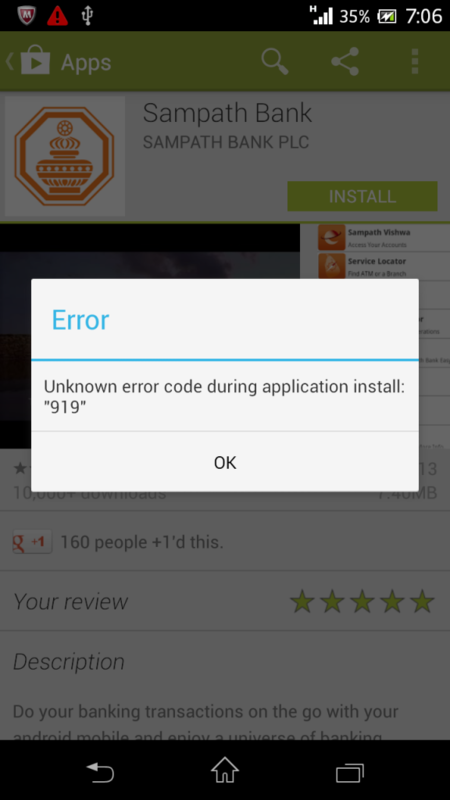 Fix/remove unknown error during application install 919 in play store. Fix/remove error unknown error 919 during application install or download from play store: after much of latest upgrades I can say android has become one of the biggest operating system platform for mobile devices. Many users are enjoying this operating system and this number is increasing everyday. But in spite of constats efforts by its developers to give us best services one has to face errors casued due to many reasons. One of the most common error is error 919. Well if you all are reading this post because you are alsao facing this error. Generally error 919 is of the form unknown error during application install 919 and after this your installation stops. In this post I will tell you some easy ways to remove error unknown error code during application install 919. Its not guarantee that methods given below will remove error 919 when you install or update apps from google play store. But still majority of people have found these methods useful as you can also try them to fix error 919 problem. Before giving you fix to remove unknown error code 919 during application install let me tell you what causes this error in your android smartphones. 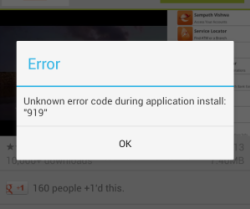 Well there are no certain reasons what causes this unknown error 919 while you try to download and install apps from google play store. Still cache file problems and ineternet connection issues causes this problem most of the time. By troubleshooting these two problems most of the people overcome from error 919 and after that there were very little chances that you will find any unknown error 919 while installing or updating apps from google play store. Below are some good methods that you can adopt to fix/remove unknown error 919 while installing or updating apps from google play store. If one method doesn’t work you must try other method and I hope you will definitely get the fix for error 919. Clear cache files and transfer apps from phone memory to internal memory. You can tranfer apps by using app called apps2sd/app manager. This will clear some space in phone memroy and hopefully no more error unkonwon 919 when you install new apps. Always ensure that memory space must be atleast twice the size of app you want to download. Go to settings à application manager à select google play à clear cache files. This method works most of the time and after clearing cache files one can easily get rid of error 919 while installing or updating apps from google play store. Many times your ISP creates some error codes which can generate error 919 and stops updating apps. So it is advisable to use play store while connected to Wi-fI. No 2G, 3G, or 4G data packs. Most of the times error 919 is seen with people using internet packs. But if you get error while connectd to Wi-Fi network then try to use another Wi-Fi network. Hope this can fix your error 919 problem. Settings à more networks à mobile networks à access point names. Here you can add new access point and use it. For eg. you can enter your friend’s APN. This enbales you to use multiple connection within same device. According to some experts error 919 occusrs on such devices that have been flashed with different ROM to factory. So to overcome the error 919 one should put back original factory ROM. I believe that one of the 3 methods given above will work for you to fix error 919 while downlaoding apps from google play store. But if it still making trouble for you then I suggest you to factory reset your smartphone. Factory rest will make your android smartphone like a new one, obviously in terms of software and not hardware :p. But before factory resetting your phone, make sure that you have backup all your important data and contacts. This final method is very common technique and have workd out for many to fix/remove unknown error 919 while installing or updating apps from play store. I hope methods given above to fix/remove unknown error 919 from google play store will work for you. NOTE: ANY DAMAGE DONE TO YOUR DEVICE WHILE REMOVING OR FIXING ERROR 919 INFOCURSE OR ANY THIRD PARTY APP IS NOT RESPONSIBLE. FOLLOW THE METHODS GIVEN ABOVE AT YOUR OWN RISK.